Tanica Hunter joined Housing Up in 2008 and was a resident of Partner Arms 2 for just over two years before moving to our Fort View apartments in 2011. Resident services has helped Ms. Hunter pursue educational opportunities. In January 2018, Ms. Hunter completed the National External Diploma Program (NEDP) with Academy of Hope. The NEDP is a High School Diploma equivalent that uses experiential knowledge and flexibility to engage students. While enrolled in this program, Ms. Hunter utilized adult tutoring services from Housing Up’s volunteers to help her complete her studies. She is the mother of four children ages 13, 11, 7 and 4, all of whom participate in resident services activities, especially our tutoring program. 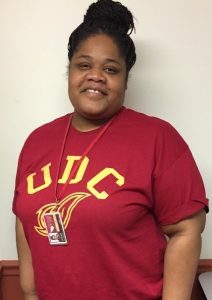 With our assistance, Ms. Hunter is continuing her education at the University of the District of Columbia (UDC). She is currently in her second semester at UDC studying to become a Registered Nurse (RN). Ms. Hunter’s educational advancement will allow her growth in the medical field where she has been employed as a Certified Nursing Assistant (CNA) and has been employed at Unique Rehabilitation and Health Center for the past 10 years.